Yesterday in Roads to the Great War, we gave a photographic preview of the preliminary work done by Mark Levitch of the very promising World War I Memorial Inventory Project. Today, we would like to provide Mark a platform so he can tell you about his hopes and plans for the project. The "bottom line," of course, is that to succeed the Project needs both financial support and workers. I hope you have seen in yesterday's posting the potential of this effort, if it receives enthusiastic backing from the World War I community. 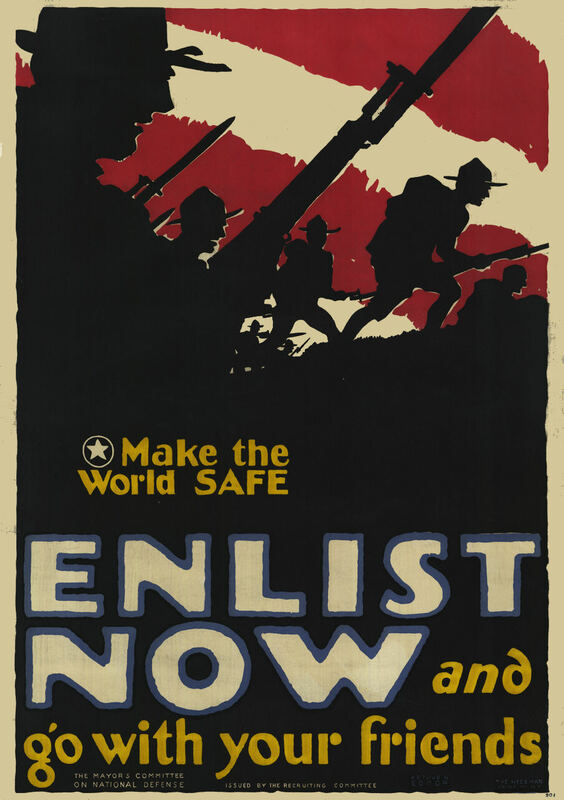 If you do, now is your chance to enlist. 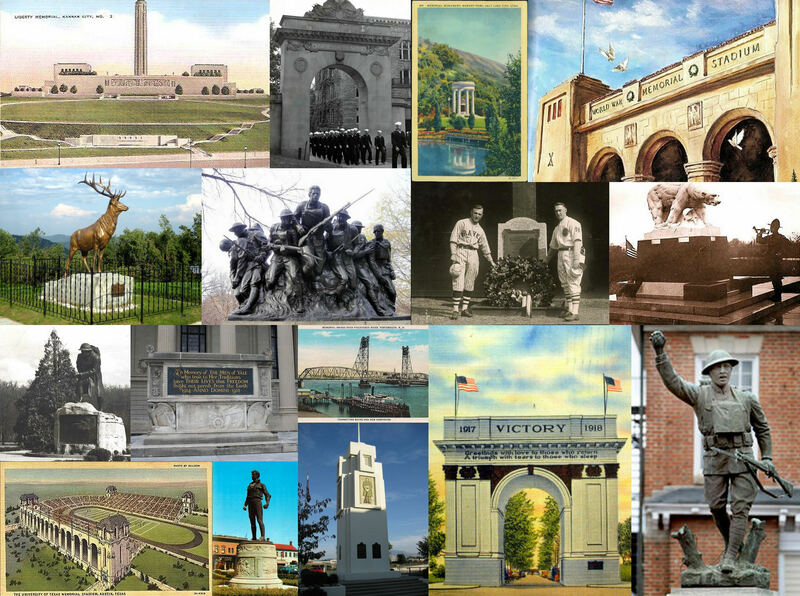 The World War I Memorial Inventory Project, which was recently endorsed by the National World War I Museum, is a volunteer-based effort to assemble an online inventory of all World War I memorials and monuments in the United States. Numbering in the thousands, spread across the country, and ranging from simple honor rolls to grandiose architectural complexes, these memorials are tangible and potent reminders of the significance the nation attached to the conflict and to commemorating those who participated in it. The first rationale for the inventory project is preservation. Even many well-known memorials are in poor condition; others have disappeared entirely due to theft, neglect, or vandalism. An inventory will identify, document, and preliminarily assess the condition of the memorials, providing a baseline record that is a prerequisite for any preservation effort. The second rationale is education. The inventory, to be conducted by volunteers – including schoolchildren – will encourage historical research to uncover the stories of local memorials and the people they commemorate (which research will be added to the memorial's record). The project will bring attention to the memorials, singly and collectively, and to the war that occasioned them. The inventory aims, too, to be a significant public history resource. Basic survey and historical information, photos, and mapping capabilities will facilitate research. The memorial database will include the names inscribed on memorials, and these, in turn, can be linked to other resources, such as the ABMC World War I database. The website will also feature short, scholar-authored interpretive essays. 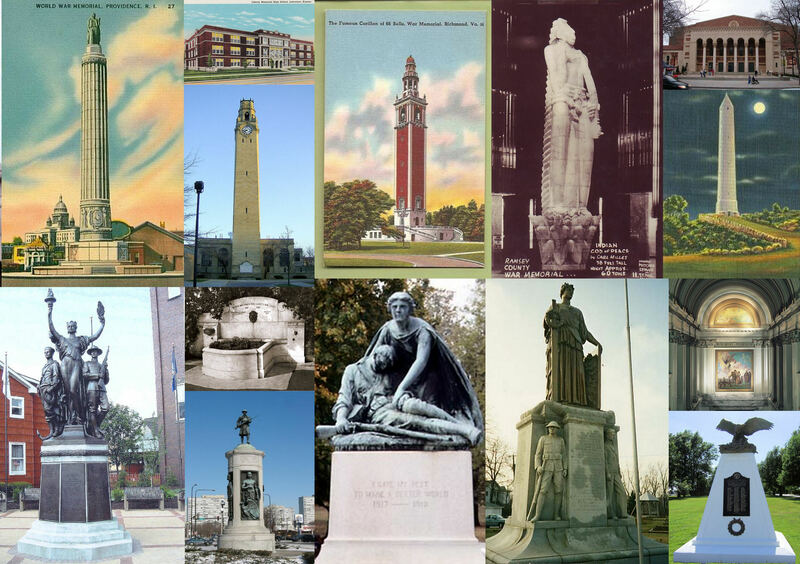 Hundreds, maybe thousands, of communities in America have World War I monuments. Often these are the focal points of November 11th events, but just as often they are neglected. Mark Levitch of the World War Memorial Inventory Project plans to help maximize the first case and correct the matter of neglect. Tomorrow Mark will describe his plans to make this come to pass, and we will leave that to him. 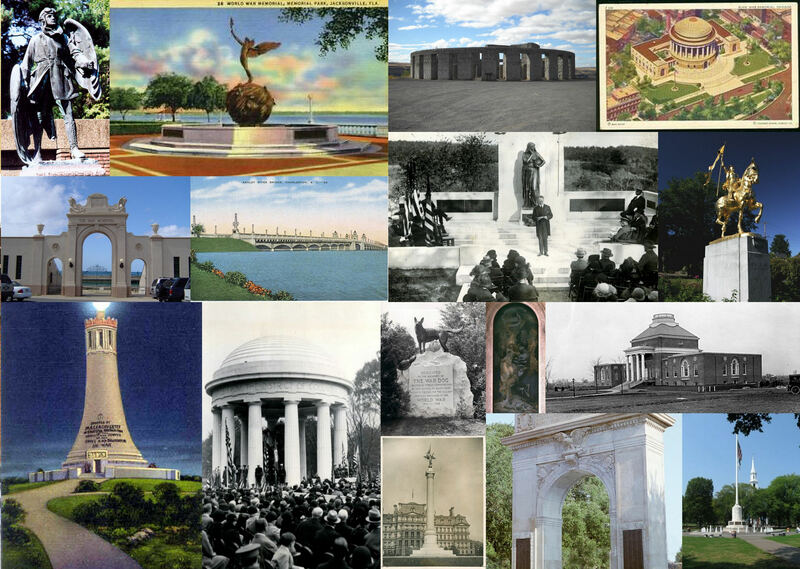 However, he has made available to us an amazing collage poster with images of some of the memorials he has already cataloged. It's so large I've had to break it into four parts. Below are thumbnails of each quadrant of the poster, just click on them and you will see the full images in all their glory. We hope you will read Mark's project description tomorrow and step up with him in this important effort. Liberty Memorial, Kansas City, Missouri (site dedication 1921; memorial dedication 1926). H. Van Buren Magonigle, architect. Soldiers Memorial Gate, Brown University, Providence, Rhode Island (1921). Charles A. Coolidge, architect. The Pagoda, Memory Grove, Salt Lake City, Utah (c. 1924; urn added 1932). Slack Winburn, architect. World War Memorial Stadium, Greensboro, North Carolina (1926). Leonard White, Jr. and Harry Barton, architects.
. Elk on the Trail, Whitcomb Summit, Florida, Massachusetts (1923). Eli Harvey, sculptor (1923 cast of a 1904 sculpture). Seventh Regiment New York (107th Infantry) Memorial, New York, New York (1927). Karl Illava, sculptor. Eddie Grant Memorial, Polo Grounds, New York, New York (dedicated 1921). Polar Bear Monument, White Chapel Cemetery, Troy, Michigan (1930). Leon Hermant, sculptor. The Doughboy, Overton Park, Memphis, Tennessee (1926). Nancy Coonsman Hahn, sculptor. World War Memorial Cenotaph, Yale University, New Haven, Connecticut (1927). Thomas Hastings and Everett V. Meeks, designers. Memorial Bridge connecting Portsmouth, New Hampshire and Kittery, Maine (1923; demolished 2012). J.A.L. Waddell and Shortridge Hardesty, designers. Victory Arch, Newport News, Virginia (1919; rebuilt 1962). Spirit of the American Doughboy, Chambersburg, Pennsylvania (1923). E.M. Viquesney, sculptor. War Memorial Stadium, University of Texas, Austin, Texas (1924). Herbert M. Greene, architect. Hackensack War Monument, Hackensack, New Jersey (1924). Charles Henry Niehaus, sculptor. Soldiers Monument, Pleasant Hill, California (1927). Clifford S. Wight, designer; Ward Montague and Ralph Stackpole, sculptors. The Aviator (In Memory of Lt. Louis Bennett, Jr.), Linsly School, Wheeling, West Virginia (1924). Augustus Lukeman, sculptor. Spiritualized Life, Jacksonville, Florida (1924). Charles Adrian Pillars, sculptor. Stonehenge Memorial (Klickitat County World War Memorial), Maryhill, Washington (dedicated 1918; completed 1929). Elks National Memorial Headquarters, Chicago, Illinois (cornerstone 1924; dedicated 1926). Egerton Swartwout, architect.
. Waikiki War Memorial Natatorium, Honolulu, Hawaii (1927). Lewis P. Hobart, architect. Ashley River Memorial Bridge, Charleston, South Carolina (dedicated 1926). Engineer unknown. Memory, Sherborn, Massachusetts (1924). William Ware Dinsmore, architect; Cyrus Edwin Dallin, sculptor. Joan of Arc, Laurelhurst, Portland, Oregon (1925). Emmanuel Frémiet, sculptor (posthumous cast). Massachusetts Veterans War Memorial Tower, Mount Greylock, Adams, Massachusetts (1933). Maginnis & Walsh, architects. District of Columbia World War Memorial, West Potomac Park, Washington, DC (dedicated 1931). Frederick H. Brooke, architect. War Dog Memorial, Hartsdale Pet Cemetery, Hartsdale, New York (1923). Robert Caterson, sculptor. Death and Victory, Widener Library, Harvard University, Cambridge, Massachusetts (1922). John Singer Sargent, artist. Memorial Library, University of Delaware, Newark, Delaware (groundbreaking 1923; cornerstone 1924; dedicated 1925). Day & Klauder, architects. First Division Monument, Washington, DC (1924). Cass Gilbert, architect; Daniel Chester French, sculptor. Victory Arch, New Orleans, Louisiana (1919). Charles L. Lawhon, architect; Albert Weiblen, builder. World War Memorial Flagpole, New Haven, Connecticut (1928). Douglas Orr, architect. War Memorial Building, Baltimore, Maryland (groundbreaking 1921; cornerstone 1923; dedicated 1925). Laurence Hall Fowler, architect. Jasper County World War Memorial, Rensellaer, Indiana (1927). Fabricator unknown. DuPage County World War Memorial, Hines, Illinois (1931). Eternal City Monument Works, fabricator. St. Joseph Memorial Chapel, Holy Cross College, Worcester Massachusetts (1924). Maginnis & Walsh, architects. Spirit of Youth, Nashville, Tennessee (1929). Belle Kinney, sculptor. World War I Doughboy Monument, Elkton, Maryland (1921). Sculptor unknown. Memorial Cross, University of the South, Sewanee, Tennessee (1922). Los Angeles Memorial Coliseum, Los Angeles, California (groundbreaking 1921; dedicated 1923). John and Donald Parkinson, architects. Victory Memorial Bridge (Glendale-Hyperion Bridge), Los Angeles, California (1930). Merrill Butler, designer. Stained Glass Honor Roll, First United Methodist Church, Winterset, Iowa (c. 1920). Artist unknown. Memorial Union, University of Missouri, Columbia, Missouri (1926). Jamieson and Spearl, architects. Memorial Hall, Racine, Wisconsin (1925). Howard Van Dorren Shaw, architect. World War Memorial, New Britain, Connecticut (1927). H. Van Buren Magonigle, architect. Victory Fountain, Long Beach, California (1926). Indiana World War Memorial Building, Indianapolis, Indiana (cornerstone 1927; dedicated 1933). Walker and Weeks, architects. 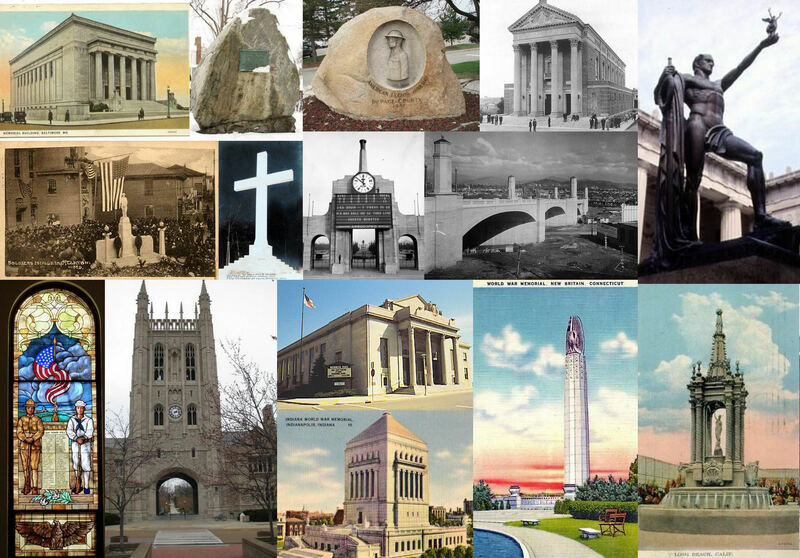 World War Monument, Providence, Rhode Island (groundbreaking 1927; dedicated 1929). Paul Cret, architect; Paul Jennewein, sculptor. Liberty Memorial High School, Lawrence, Kansas (cornerstone 1922; dedicated 1923). Raymond Ittner, architect. Virginia War Memorial Carillon, Richmond, Virginia (1932). Ralph Adams Cram, architect. Vision of Peace (Indian God of Peace), Saint Paul City Hall and Ramsey County Courthouse, Saint Paul, Minnesota (1936). Carl Milles, sculptor. Sacramento Memorial Auditorium, Sacramento, California (dedicated 1927). James S. Dean, Arthur Brown, Jr., and G. Albert Landsburgh, architects. High Point War Memorial, High Point Park, New Jersey (dedicated 1930). Hoffman Construction Company, builders. World War Memorial Clock Tower, University of Detroit Mercy, Detroit, Michigan (1927). Malsomson & Higgenbothom, architects. Soldiers and Sailors Monument, Toronto, Ohio (1919). Giuseppe Moretti, sculptor. Foresters Memorial Fountain, Golden Gate Park, San Francisco, California (1927). Gold Star Monument, Nashville, Tennessee (1922). George Zolnay, sculptor. Victory Monument, Danville, Illinois (1922). Lorado Taft, sculptor. Pro Patria, Oklahoma State Capitol, Oklahoma City, Oklahoma (1928). Thomas Gilbert White, artist. Victory Monument, Chicago, Illinois (shaft with reliefs 1927; sculpture added 1936). John A. Nyden, architect; Leonard Crunelle, sculptor. Victory Highway Marker, Topeka, Kansas (1923). Dr. Thomas Roberts, casting consultant. On 4 August 1914, Great Britain declared war on Germany.. and "her large Fleets vanished into the mists at one end of the island. "Rarely," wrote Arthur Marder, "had a fleet so itched for action or had so much confidence in the outcome." 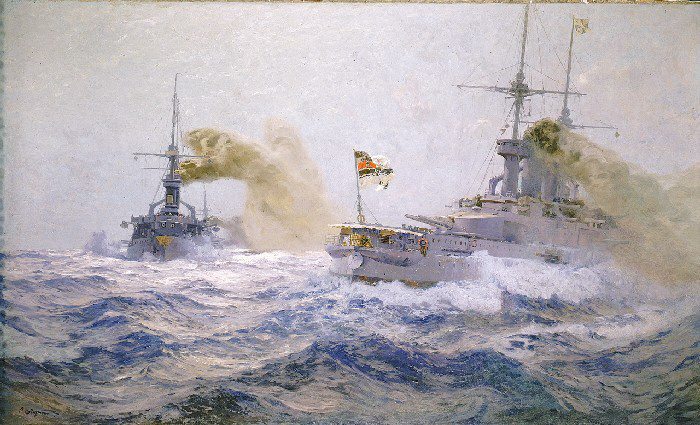 On the opposite side of the North Sea, the High Sea Fleet too waited for der Tag, convinced that "the English Navy would immediately take the offensive." Both fleets were confident that the titanic clash would take place in the first weeks of the war. 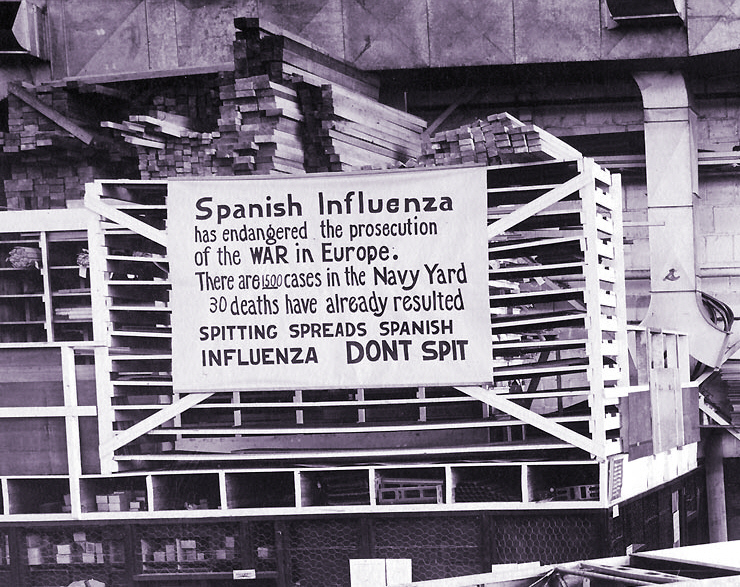 After all, everyone expected the conflict to be short, and both navies were imbued with "a healthy contempt for the defensive." Few planners on either side seem to have given much thought as to how they would reap the strategic benefits of a victorious new Trafalgar. It is difficult to conclude that, for all the mental and material preparations that went into the prospect of a North Sea Trafalgar, much systemic thought was given to how success on a Nelsonic scale was to be exploited. 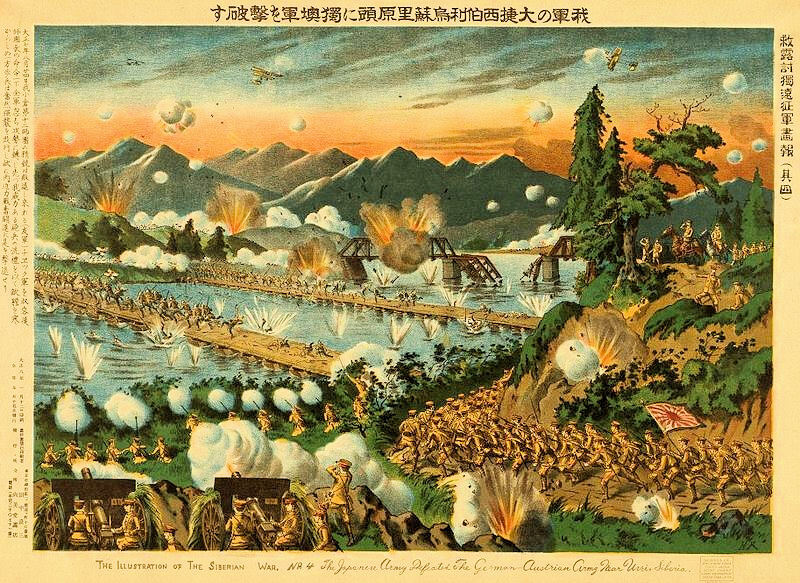 The theory of the decisive battle offered a number of possibilities. First, a great fleet action, ideally coinciding with a victorious battle on land, might ensure the short war that everyone expected. 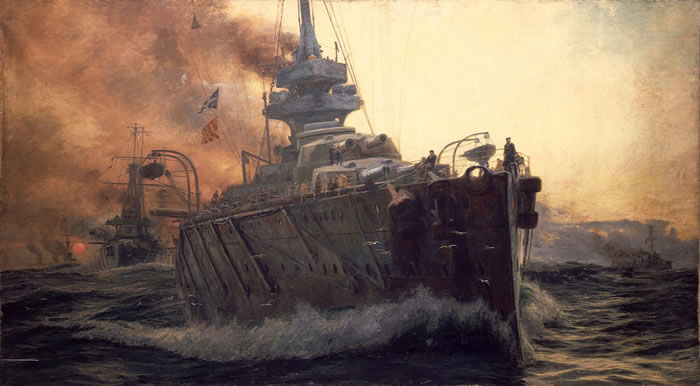 Both navies toyed with this hope early in the war, but it soon became evident that the opposing armies had settled down in the trenches for the duration and were not likely to be dislodged by a big battle at sea. In any case, neither side had given much thought on how decisive fleet action would support the armies' strategies on land. This lack of "jointness" cut the other way as well. Neither the British nor the German army war planners seem to have considered whether and how naval battle might contribute to their goals on land. The British general staff was interested in the navy's plans mainly to make sure that its expeditionary divisions would get across the Channel safely. Its German counterpart was even less interested. It thought that naval interference with the British cross-Channel expedition would be helpful, but not necessary. When the navy's chief of staff, Vice Admiral Baudission, asked von Moltke in 1908 whether the army preferred that the fleet not be initially involved in a decisive battle, he was told that the army had no objections to the fleet's full involvement and that it "would happily greet any tactical success that the fleet would have." Read Jan Breemer's ground breaking work on how the Convoy system developed to deal with the U-boat menace in WWI. If battle at sea alone could not end the war, successful fleet action might still "enable" victory by securing the sea for an invasion of the opponent's homeland and, alternatively, against a counter-invasion. Both sides, Britain more so than Germany, contemplated "peripheral strategies" against the opponent's homeland, and both reckoned with the possibility of an enemy seaborne assault. Even so, few naval and military planners on either side thought the prospect of an invasion so menacing that a decisive sea battle was called for. None of the various schemes that Churchill and others put together before and during the war for launching a naval offensive in the Baltic was contingent on wiping out the High Seas Fleet first. The reason why one or the other, Frisian Islands or the Pomeranian coast, were never invaded had nothing to do with the continued existence of the German battleships, but everything to do with the realization that the would-be invaders would not be able to maintain themselves once they had landed. On the more practical side of war planning, the British Admiralty reiterated the "paramount value of the quick decision" on the grounds that, with command of the sea in hand, cruisers could then be dispatched to hunt down the enemy's remaining commerce raiders. The argument that the big battle would ensure the safety of one's shipping rang "strategic" enough but ignored historical experience, including the aftermath of Trafalgar itself — big fleet engagements have rarely solved the safety of shipping. It is a curious paradox that Admiralty planners thought a decisive battle desirable for the sake of the safety of shipping and yet insisted that the threat to commerce would be minor compared with the depredations of Napoleon's privateers. Corbett, who was more aware of the linkage between naval strategy and commerce protection than most of his contemporaries, thought that "so far as it is possible to penetrate the mists which veil the future," the prospects for commerce destroyers making "any adequate percentage impression" were "less promising than ever." Tirpitz agreed, rejecting attack against trade as the High Seas Fleet's goal. It can be protested that Corbett, Tirpitz, and the naval profession were right; cruiser warfare on the surface would have inflicted little injury, and no one could have anticipated the havoc wrought by the U-boats. The argument misses the point, however. How could another Trafalgar be promoted as decisive for the safety of shipping when the anticipated losses before the battle were not a major concern. If the loss of merchant shipping while command was still in "dispute" amounted to no more than "breaking eggs" while the fleet waited to fry its "omelette," then why have an omelette at all, especially since the war was not supposed to last more than a few months? A final observation concerns the Admiralty's ambiguous connection between the tactical means of fleet battle and the strategic objective of the safety of the sea lines of communications. This is that, when all was said and done, the strategy of sea warfare took a back seat to the strategy of battle. The upshot was that the protection of commerce was effectively treated as a "necessary evil" that could not be allowed to interfere with the "practical" business of battle but that yet needed to be put forward as the "national" reason for decisive battle. The irony is that the Admiralty and its supporters in the press made no effort to hide the priority of the Navy 's goal over the nation's. The Royal commission report of 1905 on the Navy's readiness to safeguard the arrival of enough foodstuffs [is revealing] —"popular pressure, exercised through Parliament upon the Government" could not be allowed to interfere with the Navy's concentration for battle. The Admiralty's pen-writing supporters joined in. The "defence of commerce," wrote Thursfield in Brassey's Naval Annual in 1906, "is merely a secondary object" that "must not in any way or to any degree" be permitted to take precedence over the "primary object" of command of the sea. If the safety of seagoing traffic was not the fleet's and battle's first purpose, then what was it? The gap between strategic purpose and battle planning was even wider in the German Navy. Before the war the German Navy formulated a series of ambitious plans for fighting an offensive Entscheidungschlacht on the high seas. They contained a great deal of discussion about the operational "necessity" for such a battle, but at no point was it made clear what the outcome was expected to deliver other than a great deal of carnage. But then, the High Seas Fleet was built for "luxury." It was a fleet with all the material qualifications for battle but without a reason other than the vague notion that it would, somehow, bring Weltmacht. Had the High Seas Fleet fought and won its big battle, it is doubtful that it would have known what to do with the results. The enormity of the Great War forced nations and their people to learn new ways to wage war and to cope with the resulting numbers of losses never before imagined. Lisa Budreau's book Bodies of War is the story of America's painful journey in learning what to do with the mortal remains of the young men who lost their lives, how to honor them, and the role their families and their government would have in the commemoration of their ultimate sacrifice. Finally, when the choice was given to families to leave their loved ones in U.S. cemeteries in France or bring them home, those who chose not to bring them home were given an opportunity to travel at government expense to visit those cemeteries. Budreau tells this story, with all its interwoven political, social, and racial divisiveness in a way that is not only solid history but thoroughly fascinating as well. In a story that could easily become morbid and depressing, she writes with sensitivity and treats her subject matter with a dignity and respect not always displayed in the actual treatment of the war dead. Today, walking among the silent markers in the far too many cemeteries of the Great War, it is difficult to imagine the complex story behind the men's remains reaching these final resting places. It is, of course, impossible to imagine the pain and suffering that ended so many lives too soon. Lisa Budreau takes on the enormous task of uncovering and telling the story of a government and people confronted with a task larger and more difficult than any could have realized. 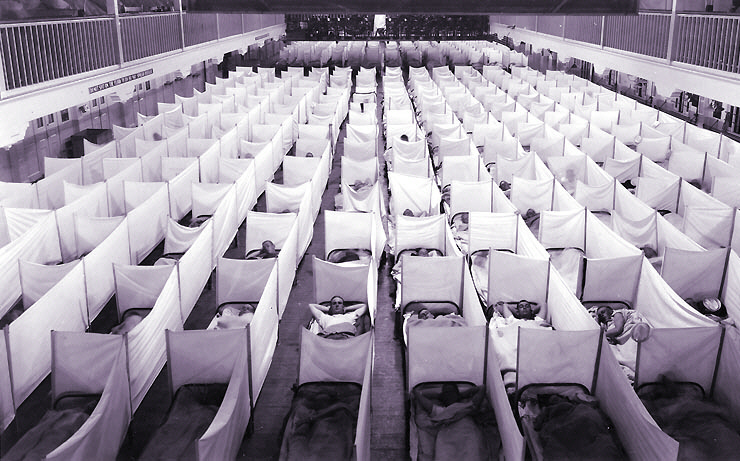 She tells of the bureaucratic as well as the physical nightmare of burial, exhumation, identification, transportation (both near battlefields and across oceans) and final interment of the tens of thousands of bodies, while never allowing the huge numbers to minimize the fact of them being individuals. Names and descriptions of how particular men were killed in action maintain the reality of their loss. Individual stories of families faced with those losses and especially the tales of mothers who made the pilgrimage to see sons' grave sites brings poignancy to that reality. While telling these stories Budreau wrestles with the overall social and cultural impact of the war and the way the United States used the war and loss of so many to help define itself through commemoration of those losses. Bodies of War is an outstanding book and should be included in any Great War collection. For historians and Great War enthusiasts alike, Lisa Budreau's book details a part of the story of the war's aftermath too often overlooked but fundamental to the understanding of how a nation copes with loss and the honoring of her sons' ultimate sacrifice. 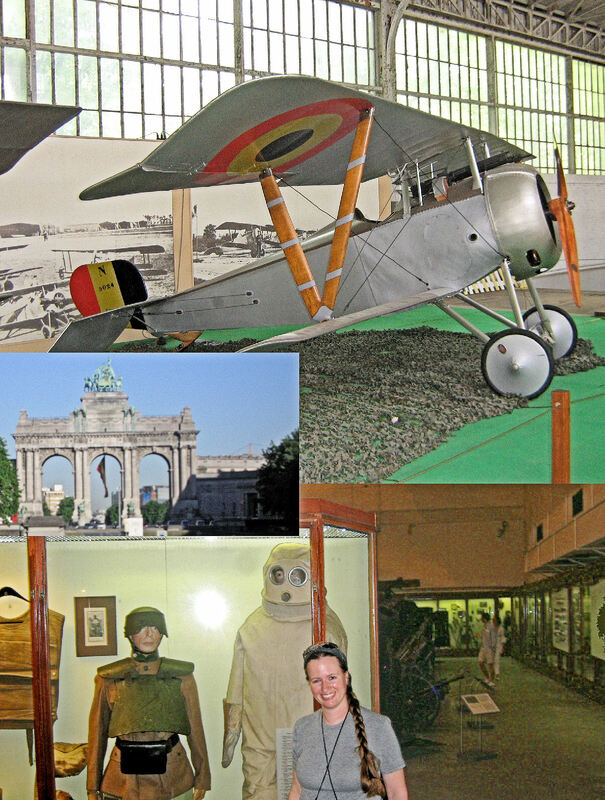 If you are visiting Brussels, and have a little time for tourism, there are some interesting sites for the World War I student. 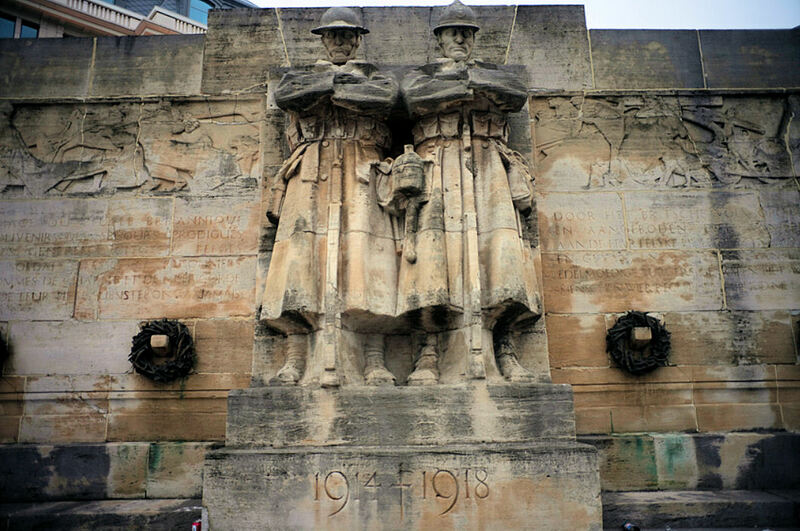 The most impressive war monument in Brussels is this British Commonwealth War Graves memorial depicting Belgian and British soldiers standing side by side, built in appreciation of support given by Belgians to British prisoners of war. 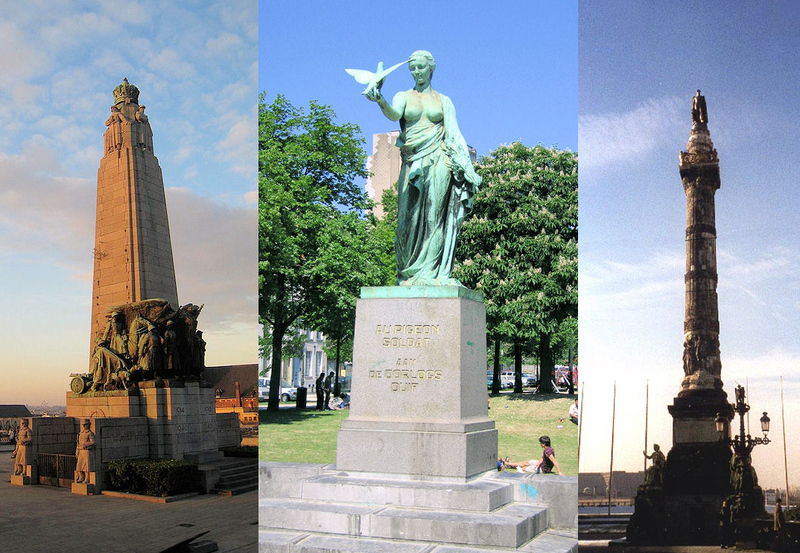 It is located at Place Poelaert. To the right of the massive commemorative arch at Cinquantenaire Park (inset) is the entrance to the fabulous Royal Museum of the Armed Forces and Military History. It covers Belgian military experience back to the Napoleonic Wars, but its Great War holdings are the stars of the show. Traveling pal Rachel Schweissinger is standing in the armaments section of the WWI hall; above is a Nieuport fighter on display in the aviation hall—one of many aircraft on display from the war. Plan on spending a half-day minimum here. 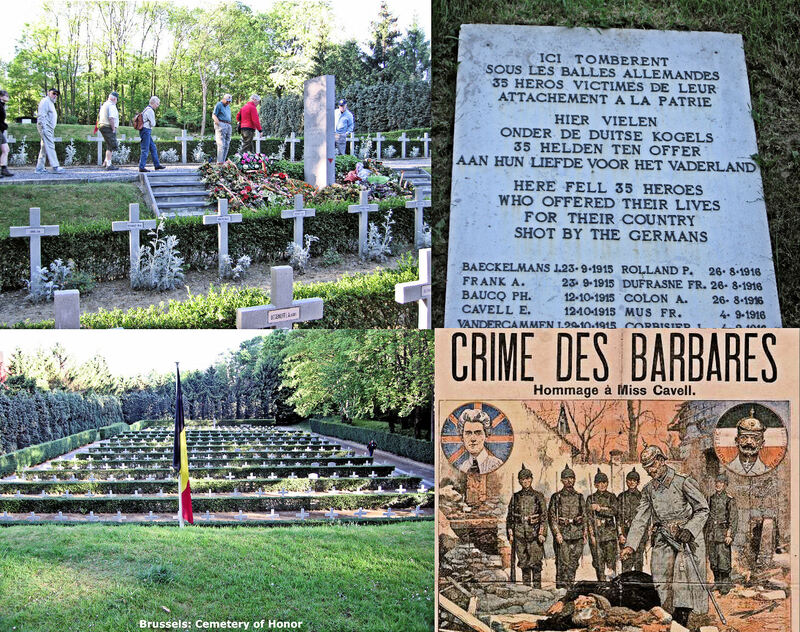 Difficult to get to, but worth the effort, is the National Cemetery of Honor located at the former Tir National rifle range in the municipality of Schaerbeek. It is where executions were held during the war, the most famous being of Nurse Edith Cavell, who was shot here. While Edith's remains were sent home to Norwich, most of the other victims are buried on the site. The national tribute to the war's carrier pigeons is located near the city's old fish market area at St. Catherine Place, which is now a restaurant enclave. Belgium's Unknown Soldier is buried at the foot of the Congress Column (Colonne des Congrés), the national monument of Belgium. 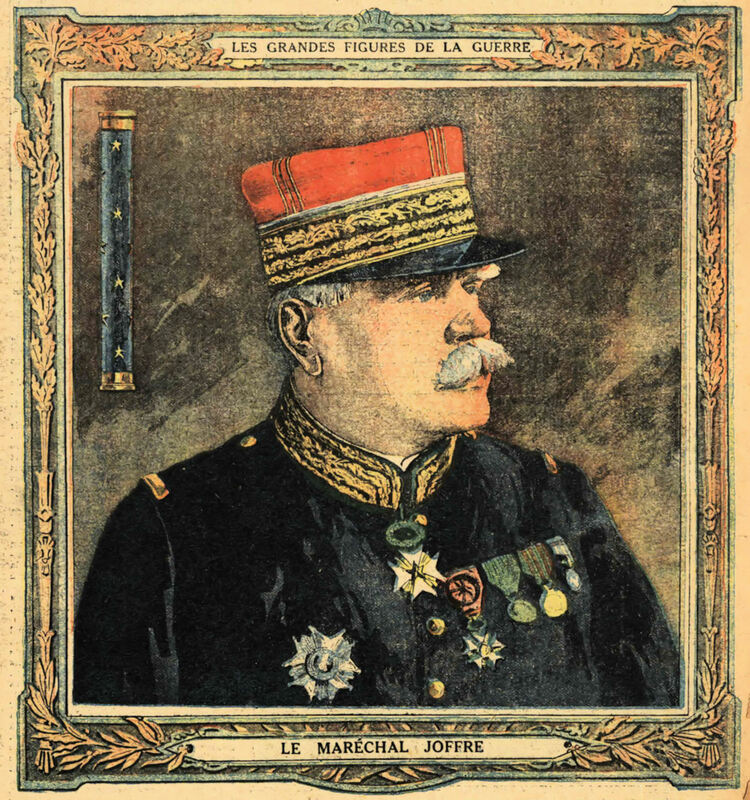 How after a month of defeats and seeing his forces and principal ally being driven back relentlessly, did General Joffre reverse matters in the First Battle of the Marne? I believe the secret is that Joffre discovered his initial strategy and war plan had failed a week before his opponent, General Moltke, did. This allowed him to redeploy his existing forces and create two new armies to take advantage of the flaws in his enemy's thinking that he had detected in observing the apparently successful German sweep through Belgium and Northern France. Most important, Joffre's greatest strength, his skill at using railroads to move his troops, would prove to be decisive for the counteroffensive he envisioned. His new guidance to his commanders was delivered in a document called "General Instructions #2," issued on 25 August 1914. The rapid retreat of the English, coinciding with the defeat sustained in Belgian Luxembourg (at the Sambre), allowed the enemy to cross the Meuse and to accelerate, by fortifying it, the action of his right. 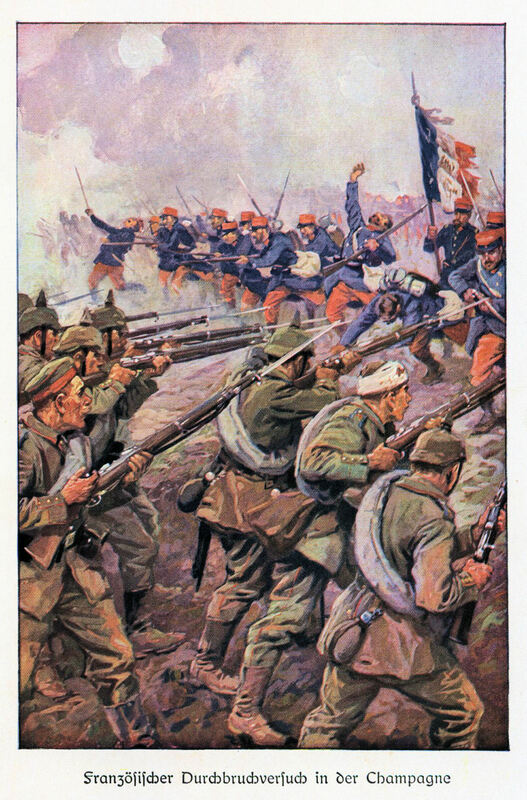 . . .My plan of August 25, besides calling for a retreat to the lines of Verdun-La Fère, also called for the organization of an entirely new French army to the left and rear of the British army. This was named the Sixth Army, which was put under command of General Maunoury. 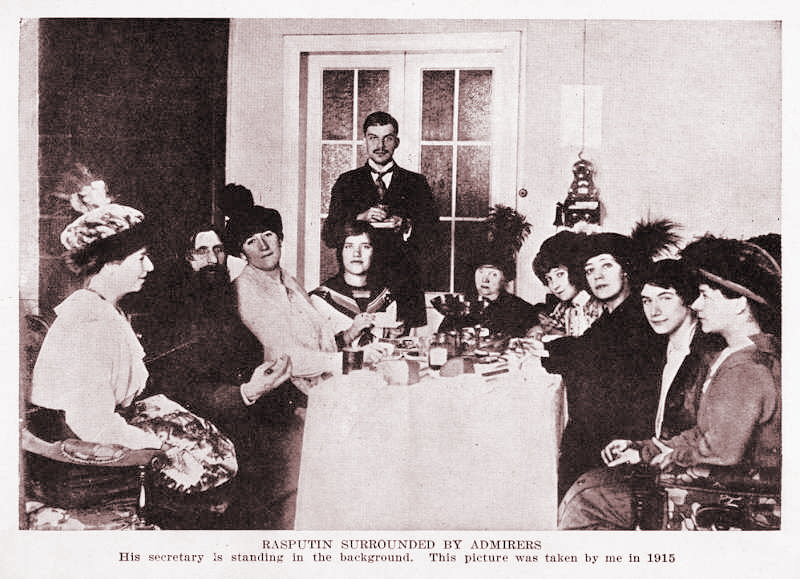 It began assembling on August 27. It was made up of troops taken from our right in Lorraine, and its task was to prevent the outflanking of our forces by itself outflanking the enemy. Eventually, it would cover Paris. Yesterday was the 99th anniversary of the first action of the British Army of the Great War, the Battle of Mons. 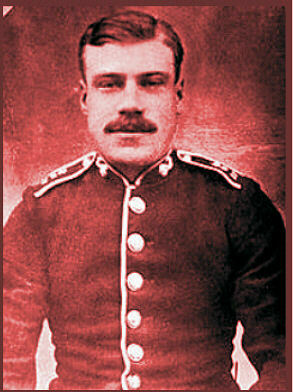 It was also the occasion of the first actions leading to the award of the Victoria Cross during the war. 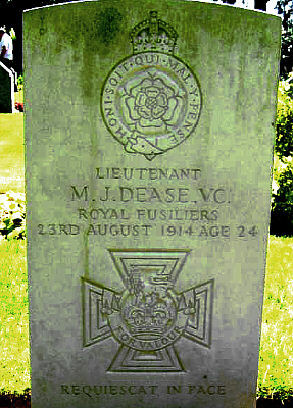 Although the first five Victoria Crosses were awarded for actions on 23 August 1914, it is generally agreed that the first two were those earned by Lt. Maurice Dease (posthumous) and Pvt. Sydney Godley, 4th Battalion, Royal Fusiliers, at the Nimy Bridge in Mons. Their machine gun section had volunteered to stay behind and cover the retreat, and they held the Germans back for several hours, during which Lt. Dease and six others were killed and Godley was wounded; Godly kept firing until he ran out of ammunition and was captured. He was notified of the award of his VC while a prisoner of war. After the war he returned home and became a plumber. An almost perfect look-alike to Bruce Bairnsfather's "Ole Bill," Godley later portrayed the prototypical British Tommy at commemorative events. An interesting postscript to this story regards the fate of the medals Godley and Dease received. Pvt. 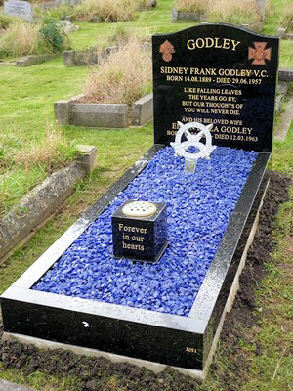 Godley's VC, with his medal set, was sold by a descendant at auction in July 2012 for £276,000. The buyer was not disclosed, but was apparently not Lord Ashcroft, the billionaire who has reportedly bought at least 177 VCs in the past 26 years — he's cagey about how many he has. This price was nowhere near the highest reportedly paid for a VC (by Ashcroft in 2009). 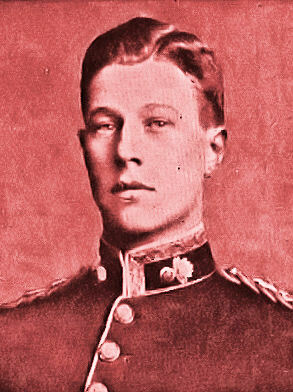 The Royal Fusiliers Museum in the Tower of London holds Lt. Dease's VC. Publishers have recruited some of today's leading historians to take a fresh look at the outbreak of the war. These titles are coming on-stream in 2013. Japan's entry into the Great War proved to be helpful to the Allies, but it had many long-term impacts that would lead to a second world war with those same allies. 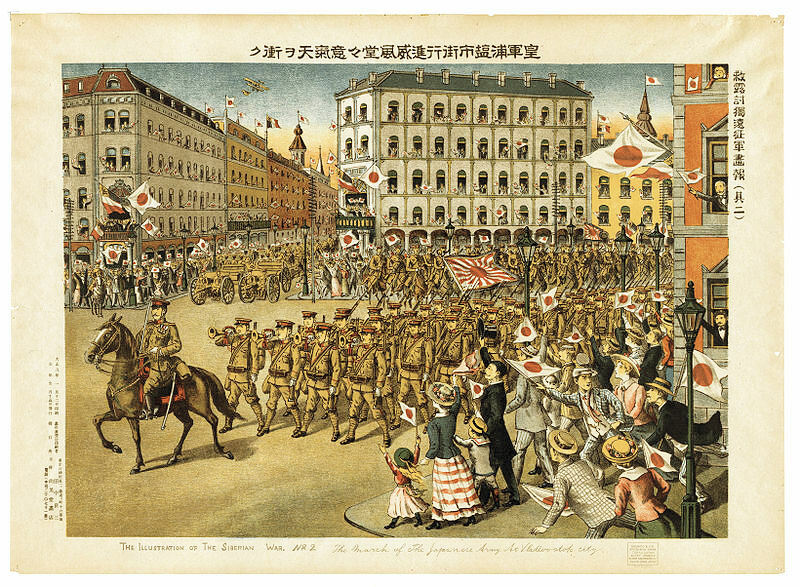 Pre-1914, the Japanese ruling elite had already tipped its hand on its expansionist aims in East Asia. Consequently, the British Foreign Office was resistant to enlisting Japan in the war effort, but the Admiralty, led by Winston Churchill, argued that the Japanese navy was needed in the Pacific and that it was better to have the Japanese as an ally than an independent operator. Churchill's view carried the day and the Japanese picked up the signal. The Japanese military and navy moved with alacrity. Before the end of the month they managed to mount a siege of (with unwanted British assistance) the port of Tsingtao (now Qingdao), which was successfully concluded by 7 November 1914. 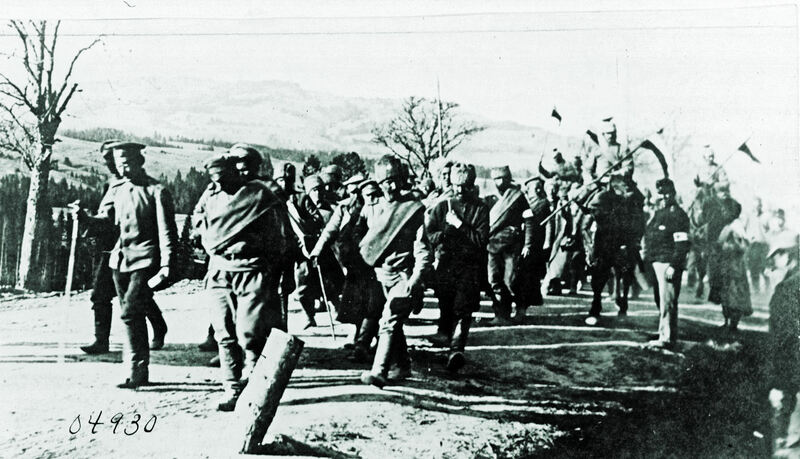 The British contingent had been excluded from planning and participating in the final attack, and the Japanese gained an independent foothold in Manchuria. Their diligent effort to expand the area under their control was precursor of their actions of the 1930s, which would lead to the Second World War in the Pacific. The Japanese Navy was active in the Pacific chasing von Spee's squadron toward South America and in the Indian Ocean searching for the raider Emden. It also escorted troop convoys headed to the Mideast and Western Front. Eventually they would be deploying ships to the Mediterranean. Another operation with long-term effects was the seizure by Japan of the German island colonies in the South Pacific — the Marianas, Marshalls, and Carolines. The capture of these islands would cost the United States thousands of marines and sailors in 1943 and 1944. 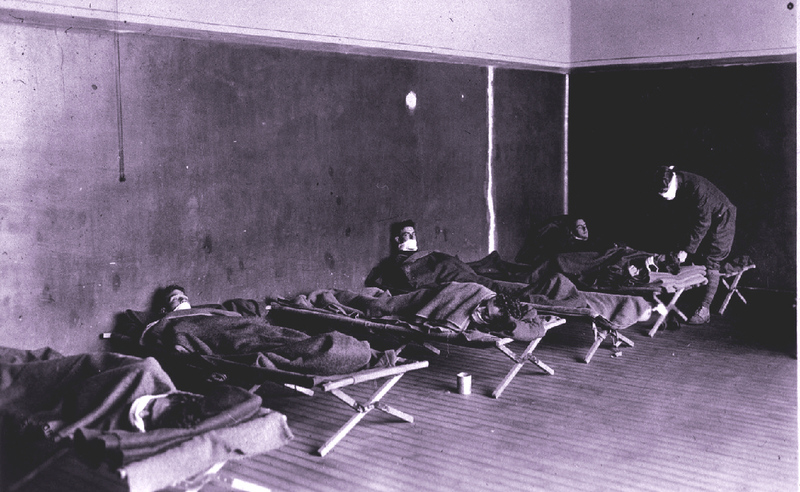 An important contribution to the war effort was Japan's assistance to Russia with ammunition, food, medical supplies, and, eventually, huge loans to sustain the government. Russia, though, would fall aside and be replaced by another power much less resigned to Japan's long term strategy in Asia. The United States and Japan had had a series of tense crises before the war but found themselves allies in 1917. There was some goodwill gained when it was agreed that Japanese ships would extend their patrols into the eastern Pacific, allowing the U.S. to deploy much of its Pacific Fleet to the Atlantic. It was short-lived, however, because the military establishments of both nations got an up-close look at one another during the controversial expedition to Siberia. America's warriors became convinced of Japan's imperial aims and its willingness to use brutal methods to achieve them. 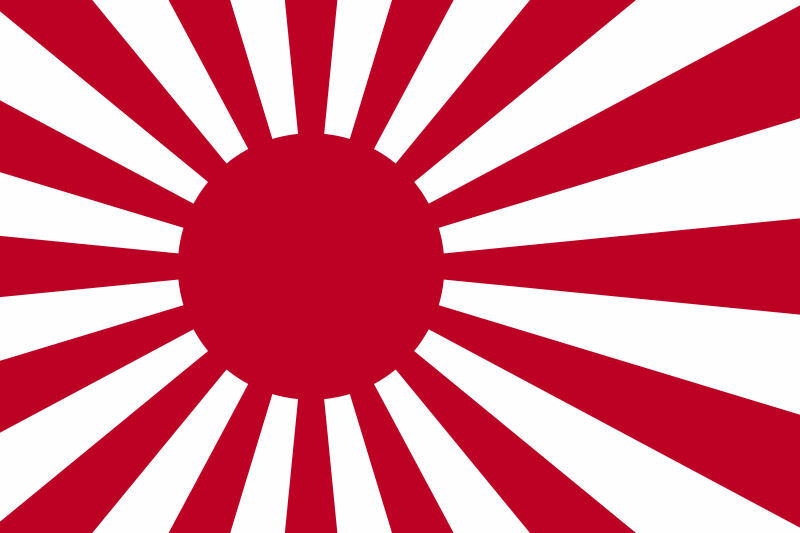 Japan's concluded for certain what they already suspected, that the United States was their inevitable enemy. The march to the Second World War—at least for the Pacific Theater—had actually begun before the First World War was concluded. Twentieth Century warfare finally established state-sponsored R&D as a public duty and necessity. Rapid development of new weaponry, ersatz strategic materials, and more productive manufacturing processes became an imperative of national survival in total war. . .the World War I model of command economy in the new technology as well as in investment and distribution was enduring and seductive. Thorstein Veblen, Herbert Hoover and assorted technocrats invoked it in the United States. . .As the Civil War produced the National Academy of Sciences and Land Grant colleges, World War I produced the National Research Council and the Nation Advisory Council for Aeronautics [predecessor to NASA]. 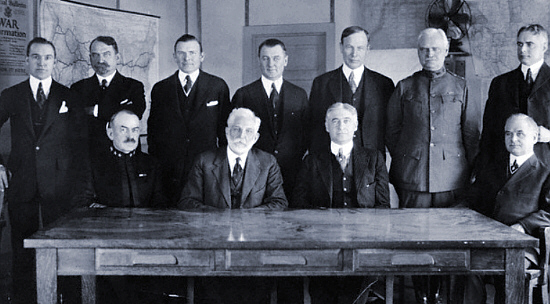 Interestingly, the War Industries Board was dissolved in 1919, but many of the new agencies were kept, and much of the expansion of government departments remained, at least at levels higher than those before the war. World War I is when government, impelled by the technocratic demands of war started to become enormous. The graph below that shows how government spending predictably consumes more of the economy during wartime is quite revealing in another respect. Each of the peaks corresponds to a major American war: the Civil War, WWI, and WWII from left to right. 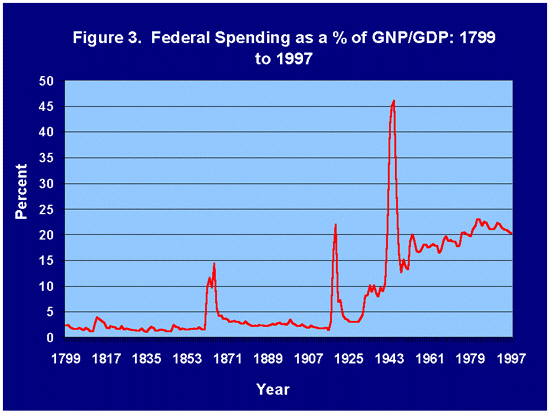 After the Civil War, the percentage of government spending returns to about prewar levels. This does not, however, occur after either World War. In both cases not only is the postwar percentage higher than before the war, but the percentage continues to grow during peacetime. This is because the "command economy" approach, as McDougall points out, proved to be enduringly "seductive." All the participants in the war had full-color magazines that purported to cover the war but were unknowingly (or is some cases knowingly) instruments of state propaganda. All of them portrayed the frontline soldier with maximum sympathy. The finest artists and illustrators were called upon to assist with this effort. 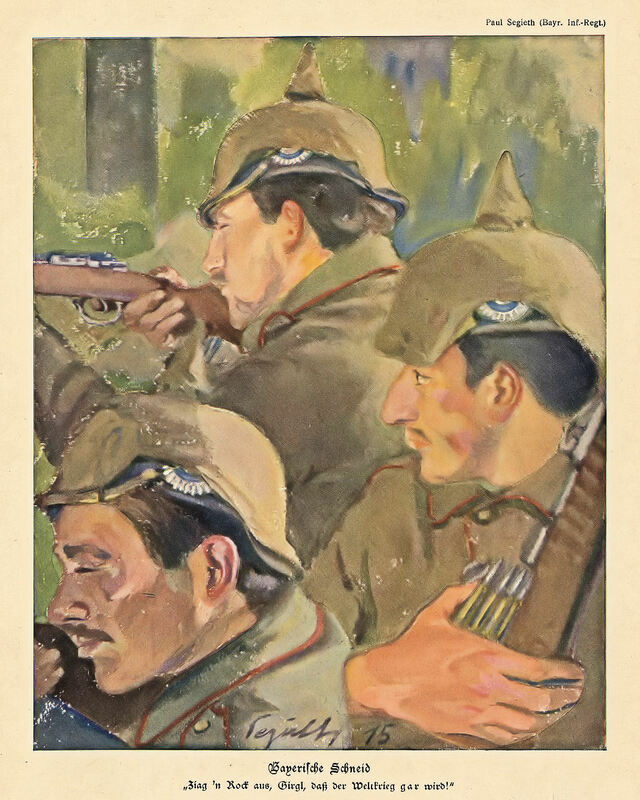 I thought the readers might enjoy some of these moving depictions of German troops from the early war period. 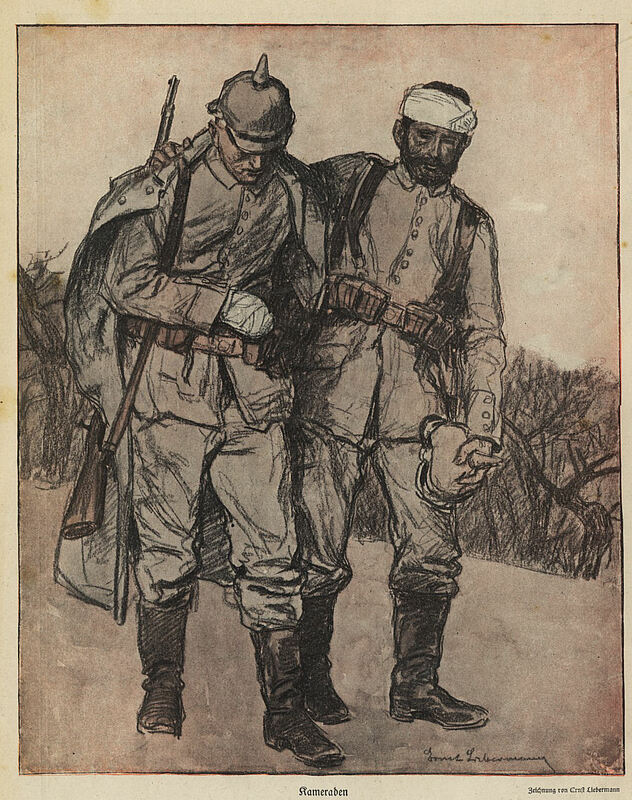 The illustrations below—from Tony Langley's collection—show the German soldier at his most stalwart and dutiful. The background and conduct of the war is well summarized, and other areas of the conflict are continuously referenced, thereby keeping the Ypres salient in context throughout the narration. After touching on the Race for the Sea when the War becomes more static, the author narrows his scope to Flanders and describes the geography, weather, crops and culture of the area. Flanders, in Flemish, evidently means “flooded land.” This realization set the stage for me to better understand the horrors that followed. Trench warfare? Groom divides the 1914-1918 action in the salient into the major “battles” that took place there. This division allows the reader more understanding of the time-line even though the author periodically points out that there were many hundreds of casualties daily during the non-battle, or “quiet” times—so much so that many of the “battles” might better be termed major “flare-ups.” Reinforcing our understanding are a few good maps showing movements, territory taken or lost, and well-annotated place names. As can be imagined, with the scope of this misery there are many individual stories. Two of these are of the “crackpot” Canadian war minister who insisted on the Ross rifle (one officer reported that it took four men to keep one rifle working), and of the Irish major William “Willie” Redmond, who had fought for an amicable solution to the “Irish Problem” and who insisted on advancing and attacking Wytschaete even though he was wounded. Helped by a Protestant soldier from the Ulster Division, he later died. The next day, his funeral was attended by four generals while condolences arrived from all corners of the globe: from the Pope, the King and Queen of England, prime ministers and presidents. Included in this book are two sections of very good photographs, reminding one of Groom’s early fascination with the Michelin Guide. All in all, I now better understand the British fixation on this part of the war, including such famous names as Hill 60, Messines Ridge and Passchendaele. So many casualties under such horrendous conditions. It boggles the modern mind. The effect of the war upon the United States will depend upon what American citizens say and do. Every man who really loves America will act and speak in the true spirit of neutrality, which is the spirit of impartiality and fairness and friendliness to all concerned. . .[D]ivisions amongst us would be fatal to our peace of mind and might seriously stand in the way of the proper performance of our duty as the one great nation at peace, the one people holding itself ready to play a part of impartial mediation and speak the counsels of peace and accommodation, not as a partisan, but as a friend. . .The United States must be neutral in fact, as well as in name, during these days that are to try men's souls. We must be impartial in thought, as well as action, must put a curb upon our sentiments, as well as upon every transaction that might be construed as a preference of one party to the struggle before another. 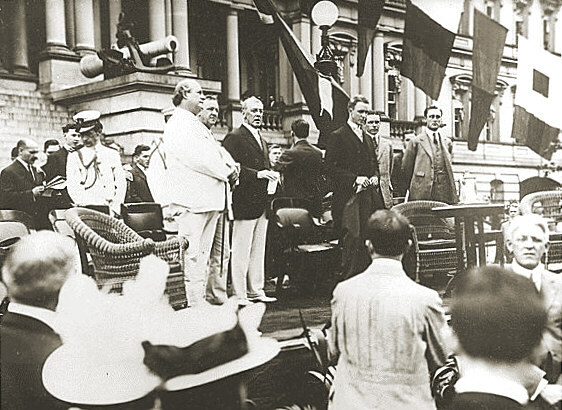 Secretary of State William Jennings Bryan (White Suit) and President Wilson at a 1913 Rally. The Nautical Trapping and Presence of Navy Secretary Josephus Daniels and Assistant Franklin Roosevelt Suggest a Naval Theme. This was the official position, and some people, like Secretary of State William Jennings Bryan felt that was to be the nation's posture, throughout the hostilities. Historian Thomas Fleming, however, in his 2004 work Illusion of Victory scathingly described what happened next. American neutrality, in short, was a sham. . .Wilson talked—and talked and talked—about neutrality and apparently convinced himself that he was neutral. But the United States he was supposedly running was not neutral, in thought, word or deed, thanks to Wellington House in London—and the international banking firm of J.P. Morgan in New York. . .Morgan and his fellow bankers were the key players in the shift from genuine to sham neutrality. [After a request for a loan request from the French government early in the war, the U.S. government issued this statement: ] "Loans by American bankers to any foreign government which is at war are inconsistent with the true spirit of neutrality. [However] as British and French orders for ammunition and other war material filled the books of U.S. companies, the pressure for financial assistance to pay for them grew more and more acute. Soon Robert Lansing [a Counselor at the State Department and soon to replace Bryan as Secretary of State] convinced Wilson that loans might be a violation of America's neutral stance—but the granting of "credits" to England and France by the House of Morgan and other banks was legally justifiable. . .Twenty years later in a Senate hearing, J.P. Morgan was asked about the difference between loans and credits. His testimony made it clear that practically speaking, there was no difference. . .By 1916, the Untied States was supplying Great Britain, France, and Russia with 40 percent of their war materiel. By permission of Mr. Fleming; photo from the FDR Presidential Library. We recommend this trilogy by Thomas Fleming, one of the rare historians always ready to challenge the cant and received wisdom of our times. "I Did Know Fadder, Don't You See?" Section Two's John Fisher, who's been trying for more than a month to get to Paris to see his family, is at last granted "permission." His famous wife, the writer Dorothy Canfield, and their two children, Sally and Jimmy, after a long trip from their Vermont farm, reached Paris in early August. John has been separated from them for more than six months. Dorothy knows that John has been homesick for his family for some time, and when he admits it in a letter to her in June, it made me feel as though I ought to start by the next steamer. In fact, she's not so sure [she] can hold out much longer without John. As soon as she puts her affairs her order, she and the children set off for France. In Paris, they move in with a friend, Celine, who lives at the Villa Montmorency, in the suburb of Passy. A high iron fence, thick with ivy, encloses the villa. There's an iron gate, as well, which locks with a great big key, Dorothy writes her family in Vermont, like a key to a prison. Three concierges guard the place. And Celine, like a true, suspicious city-dweller, goes around every evening, shutting all the iron shutters, locking every door that has a key. Dorothy feels secure in her new home. She and the children live upstairs in a large room. Sally sleeps in the big bed with her while Jimmy has the couch all to himself. There's also a bathroom, an unheard of luxury, beams Dorothy. It's 12 September, when John, eager to see his family, boards the train from Rampont, a few kilometers southwest of Verdun, for the long, tedious ride to Paris. The train is due at the Gare de l'Est at seven in the evening. Dorothy and the children wait for him there, as anxious as he for the family reunion. Sally teases Jimmy, saying he won't recognize their father. Jimmy says he will too. At seven the train fails to show. The hours creep on, and still no train. Now Dorothy's not so sure she has the right date. Because John's section has just moved to Rampont, perhaps at the last moment he isn't able to get away. She waits for more than four hours and still no train. Finally, at eleven she takes the children home and puts them to bed. She climbs in next to Sally and tries to stay awake in case John does arrive and she can hear him at the gate. Another hour slips by, and she falls asleep. At one-thirty, the train creaks into the Gare de l'Est. Carrying his duffel bag over his shoulder, John wearily steps onto the platform. His first thought is to find a hotel, stay the night, and then find his way to the villa in the morning. But his furlough is too short and he wants to spend every second of it with his family. He hails a taxi and the driver, he writes, Dumped me down at a gateway with Villa Montmorency over it." John knows the apartment, he thinks. After locating it in the dark, he's not sure if it's the right one. He tries the gate. It's locked. He rings the bell. But he's unable to wake anyone. He rings it again, this time waking a dog. Like a burglar he scales the high iron fence and drops down into a garden. Looking up at the second floor, he spots an open window. He reasons that because "French people don't like night air" it must be Dorothy's. He whistles. Inside the bedroom, Dorothy opens her eyes at the sound of the whistle. She hurries to the open window. In the starlight she makes out a man in uniform. "John?" she says in a low tone. "Dolly, it's me!" Dorothy lights a gas lamp and lets John in. They kiss and hug and for a long time look each other over. He looks older to her, "very brown and hard and weather beaten and bald!" He's also shaved off his trademark beard. "His meditative, mild look of thoughtfulness, which is his characteristic expression, has apparently all gone with his beard." After a cold dinner she takes him upstairs to bed. When Sally sees her father she breaks into tears of joy. Jimmy sits up in bed. "Is he here?" he asks, rubbing his eyes. And, triumphantly to Sally, he says, "I did know fadder, don't you see?" And then he falls back, sound asleep. "Jimmy" mentioned in this account would grow up to be Dr. James Fisher and during World War II would join the U.S. Army. He volunteered to serve in the "Great Raid" at Cabanatuan to rescue American prisoners of war in January 1945. Tragically, he died during the mission. One of history's most memorable debauchees played a role in the destruction of Russia's Romanov dynasty during the Great War. Just after the turn of the century the wandering, unordained Siberian monk Grigorii Rasputin made his way to St. Petersburg and soon made a powerful impression on the Russian capital. His unique brand of mysticism, soothsaying, and faith-healing combined with epic bouts of drunkenness and seductions of legions of aristocratic females were the building blocks of legend. One of his miracle cures — apparently legitimate — involved reviving Tsarista Alexandra's close friend Anya Vyrubova from a coma after her traumatic injury in a train derailment. When Alexandra later confided to Anya that her son, Tsarevich and heir to the throne Alexis, was suffering a bout of bleeding—potentially fatal due to the inheritance of hemophilia from his grandmother Queen Victoria — Anya could not do less than recommend her healer to the service of the Romanovs. The Tsarevich responded immediately to the ministrations of the monk and similarly during later episodes. It is unknown whether his technique for halting the bleeding involved hypnotism or simply calming the lad. His success, however, won him the protection of the Tsarista, unfailing until the day of his death. News of these good deeds, however, was contained within the ultra-private world of the royal palaces. 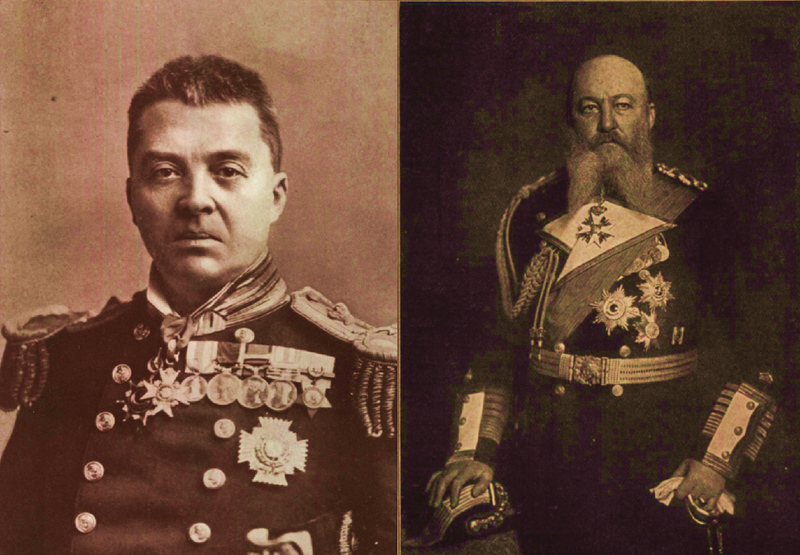 Nicholas and Alexandra had no inclination to advertise the heir's medical condition or their indebtedness to Rasputin, so the proximity of a rake and charlatan to the nation's supreme rulers seemed utterly baffling to the rest of Russia. The appreciation of Rasputin among the governing classes of the capital was implacably hostile and, when war came, grew unremitting. Grigorii, a loud and obnoxious drunk, was his own greatest enemy. Gossips and enemies of the throne elaborated his loutish bragging about his sexual conquests of the upper crust to suggest he claimed the four grand duchesses and the Tsarista, herself, as conquests. 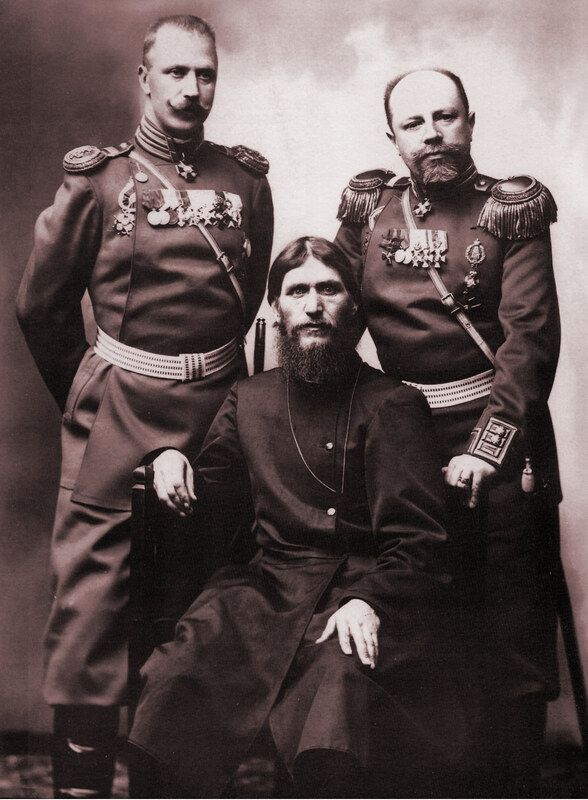 Tsar Nicholas became so enraged with Rasputin he banned him from the capital, but fatefully, his son soon had another bleeding episode, and Alexandra demanded his return from banishment. Interestingly, the extended Romanov family was very resistant to Rasputin's charms. Grand Duke Nicholas, commander of the Russian Army, responded to an offer for a visit to his headquarters by the monk with a promise to hang Rasputin if he ever showed his face. It would be food riots that would trigger the Russian Revolution in early 1917. If I die or you desert me, you will lose your son and your crown within six months. Quoted in The Romanovs, W. Bruce Lincoln. The Christian Science Monitor says this is the best book on Rasputin. Enough said. At the start of the First World War, German forces had a distinct advantage in the use of grenades for close-in work as the trench system took shape. Their opponents improvised in response, the British distributing the famous Mills Bomb grenade by 1915. 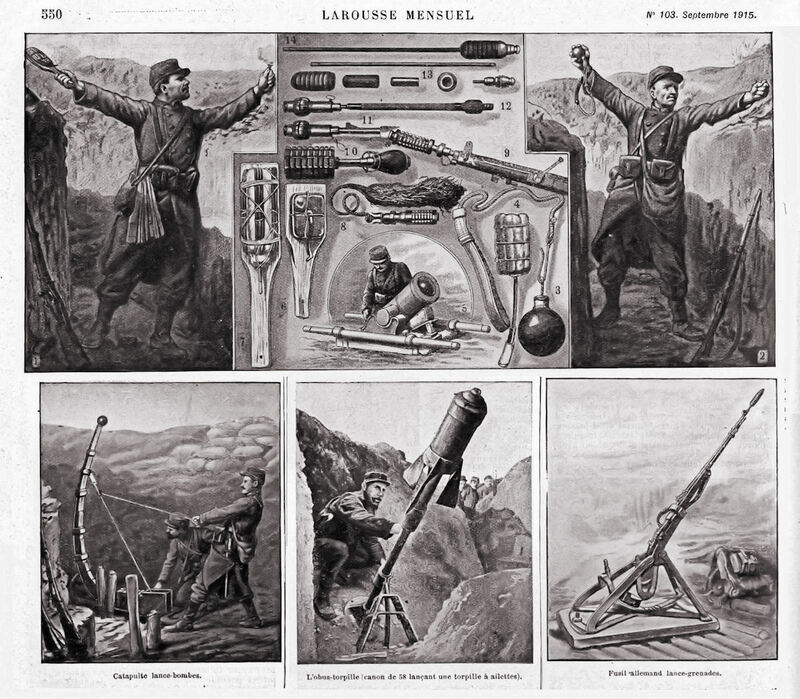 Below are images of some of the French solutions, which were published in the monthly Larousse Mensuel in September 1915. It shows grenades in numerous configurations, but the most interesting illustrations are of the launching systems. That explosive charges, rifles, and strong arms were used to send grenades toward the enemy, is well known. Launching them via catapults and ping pong paddles, however, is not well documented. The illustration below—from Tony Langley's collection—also includes a drawing of a primitive mortar. The two best books on infantry weapons in the war. As I discussed in yesterday's Road to the Great War posting, I believe Poland should provide historical markers or monuments to identify the location of the battle of Tannenberg and to acknowledge its importance. Ideally, Polish cultural and historical authorities would create a whole series of markers which would allow Poles and foreigners alike to trace the German and Russian movements in the battle. If, on the other hand, the various Polish governmental authorities have sufficient funds to provide a marker at only one site, I will propose three different potential locations. My first suggested location for a monument would be along the main road between Neidenburg (now Nidzica) and Willenberg (now Wielbark). 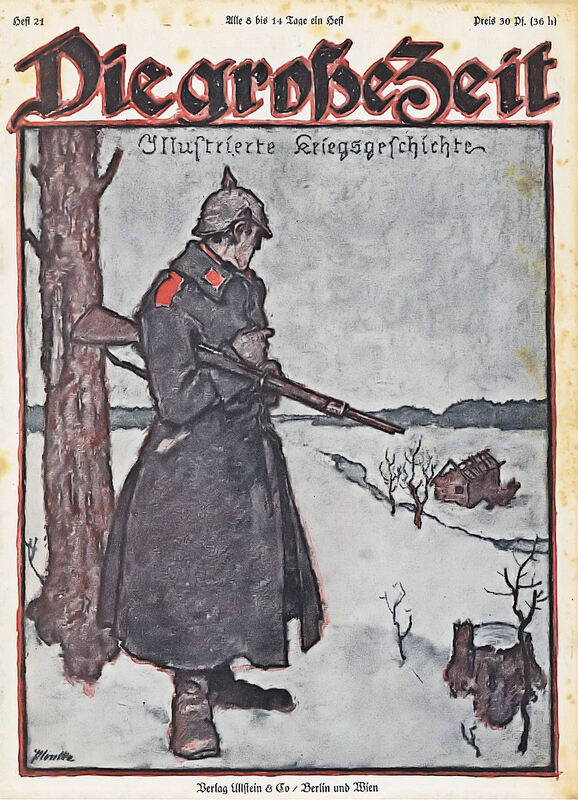 The Germans dramatically defeated the Russians at Tannenberg because they were able to encircle the Tsar's forces as they attempted to retreat to the south. The trap was sprung by the German First Army Corps under General Francois as he moved between Neidenburg and Willenberg. 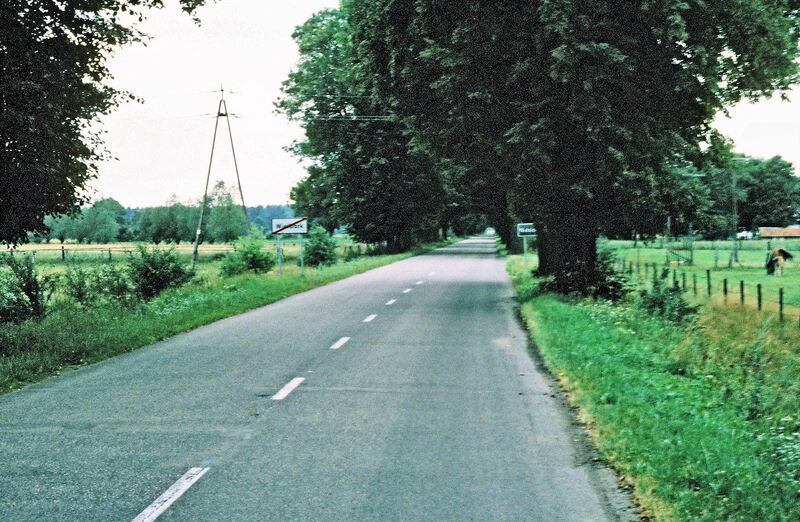 In this photo of the rural area between the two towns, the Germans would have been coming from the west directly toward the viewer. The retreating Russians would have been to the right (north). Battle of Tannenberg, Map 7 at pages 96 and 97 in A Military Atlas of the First World War (1973) by Arthur Banks will help the reader visualize the scene. Alternate locations for a monument could be at the memorial park for the 1410 battle of Tannenberg ("Tannenberg I") or the city park in Olsztynek (formerly Hohenstein) where the Tannenberg Memorial once stood. Both of these locations could be subject to objections. The Tanneberg I site is where an alliance of Poles, Lithuanians, and Tartars, commanded by Polish King Wladyslaw Jagiello, defeated an army of German Teutonic Knights in the largest medieval battle in Europe. Poles might object to a Great War memorial here as diluting attention from what has traditionally been viewed as a great moment in their history. For many Poles, the World War I battle was conflict between foreigners. Besides, little actual fighting took place at this location during the World War I battle. Strong objections might also be raised against the site where the German Tannenberg Monument once stood. Mainly this would be because of the Nazi association, although the monument was built between 1925 and 1927 — years before the Nazis came to power in 1933. In our next articles in September we are going to examine the cases of the missing memorials for the Gorlice-Tarnow offensive, the Siege of Przemyśl and the actions at Limanowa and Lapanow. Two excellent introductions to the war on the Eastern Front.